Mix the flour, spaetzle flour and salt in a bowl, make a well in the middle. Combine the milky water and eggs, gradually pour into the well while stirring, mix everything together and beat until the dough starts to bubble. Cover and leave to stand at room temperature for approx. 30 mins. Press the dough in batches through a spaetzle sieve into the simmering salted water. Cook the spaetzle until they float to the surface, remove with a slotted spoon, drain. 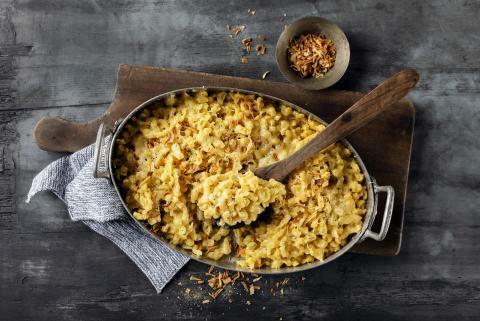 Fill the prepared dish with alternate layers of spaetzle and cheese, season. Approx. 10 mins. in an oven preheated to 200°C. Serve with fried onions.